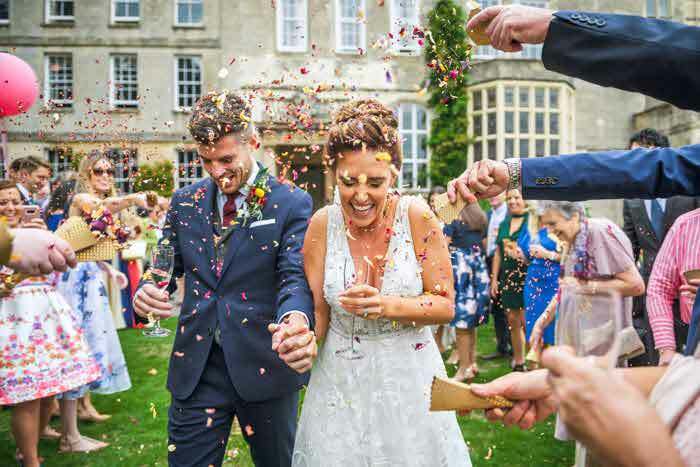 Sophie Amelia, owner of wedding stationery company Sophie Amelia Designs, talks us through this shoot put together by a host of Dorset suppliers. 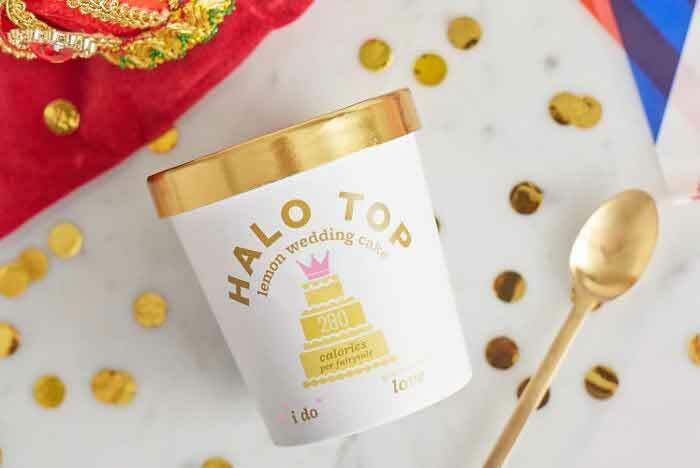 Offering several predictions on what Prince Harry and Meghan Markle will choose for their wedding day, the shoot celebrates the royal romance and shines a light on their modern love story. Peter Gale was our Prince Harry lookalike for the day, and was delighted at the opportunity to wear an authentic Royal Marines uniform, which was worn by an officer who served in the same regiment as the prince himself. Samantha Shapley from Dorchester posed as Ms Meghan Markle for the day, and modelled the British designer gowns so elegantly. 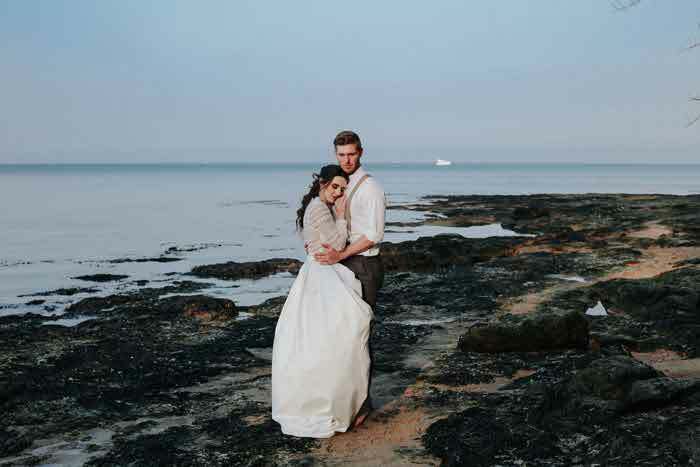 Dorset-based wedding photographer, Aimee Joy Photography & Design, captured the day in her authentic and natural style, making the most of the natural light. Upon visiting The Duchess of Cornwall, she fell in love with the extravagant stairway. The golden glint of the framed artworks flaunted a regal flare and rich lustre. This backdrop created a perfect contrast with our beautiful bride and wedding gowns. 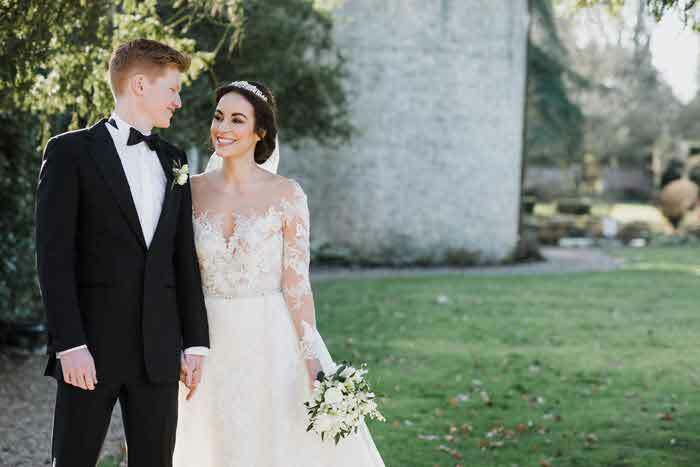 Throughout the shoot, Aimee referred to our models via the names Megan and Prince Harry to really empower them with the characters they were portraying, and everyone loves a bit of role-play now and again. This helped to nurture elegant and natural posing, which worked seamlessly with our surroundings. With the bridal table Aimee wanted to capture every little detail, even the reflections made in the rose gold glasses. 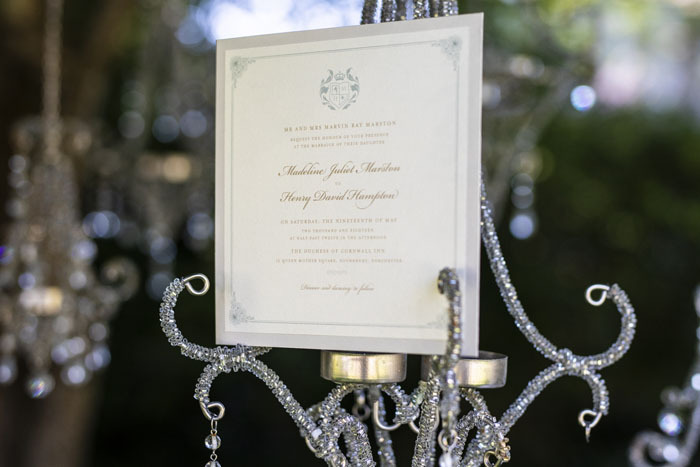 She used a shallow depth of field to allow the lighting from the chandelier and golden surfaces to create a wonderful bokeh effect within the images. Once the first part of the shoot was complete, she then photographed our outdoor garden scene. 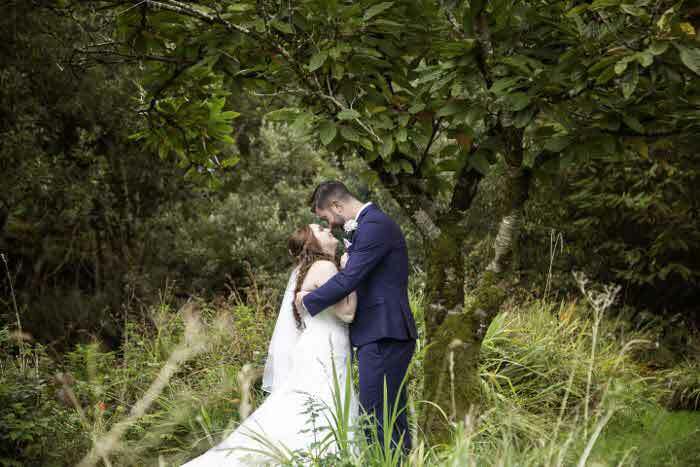 For Aimee, the natural light dispersed through the canopy of the tree was a photographer's dream. 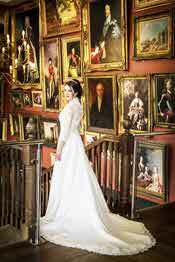 The Duchess of Cornwall Inn in Poundbury, offered the perfect setting for the photo shoot, not only for its connection to the Royal Family but also for its regal and opulent staircase with a backdrop of historical oil paintings. 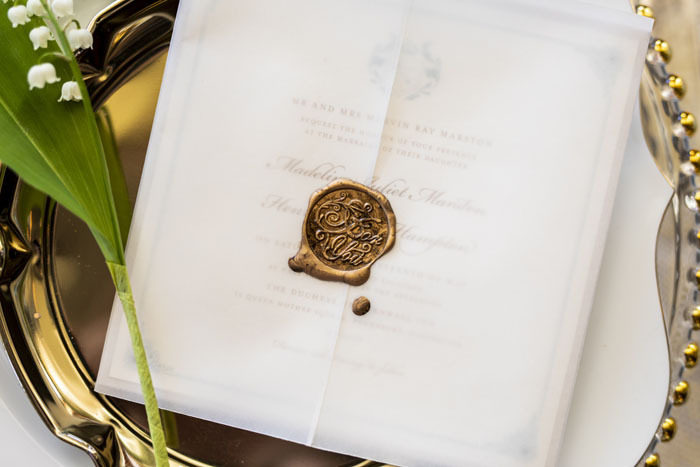 I designed the stationery collection for the photo shoot and it was really important that the designs mirrored the fonts and styles of the royal wedding invitations, but also comprised their own individual elements. I created a square format collection by bringing in classic, traditional themes such as the royal emblem. 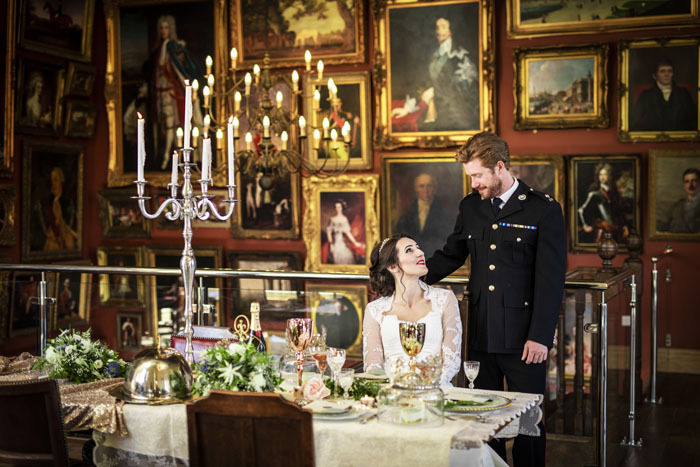 Prince Harry and Meghan’s romance story was told through the soft colour palette of ivory, soft teal and blush bronze. 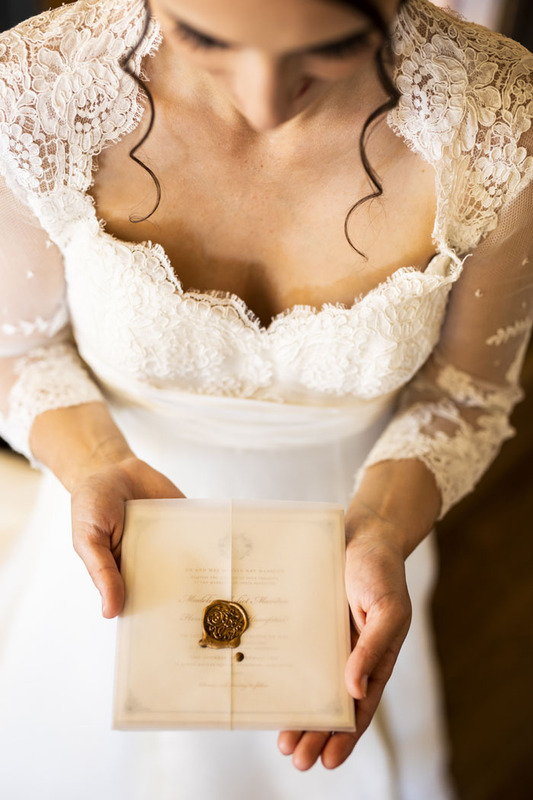 The look was made complete with a bronze wax seal holding the transparent sleeve containing the important details for the wedding day. 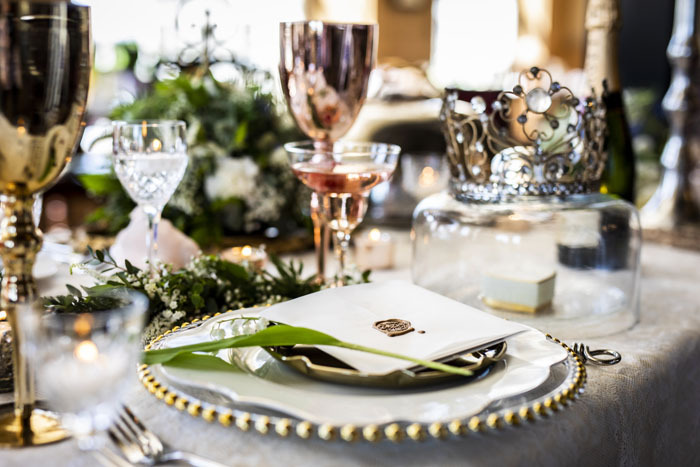 A touch of luxury, stationery for couples that say "I do." 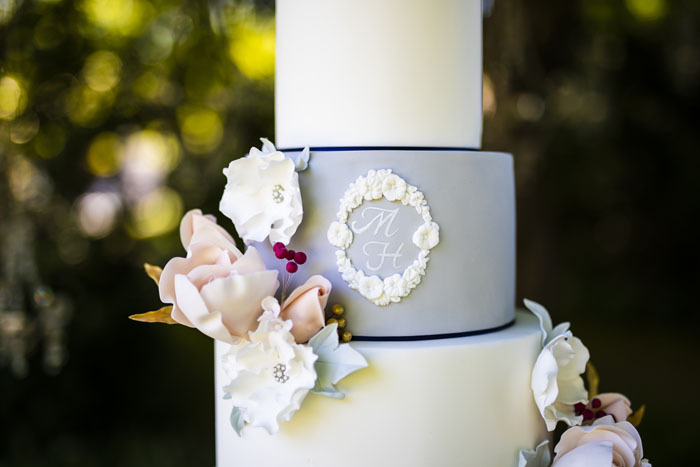 Bekki from The Sweet Suite Artisan Cakery supplied a stunning five tier cake adorned with beautiful flower fondants and pretty silver diamante embellishments to reflect Meghan Markle’s engagement ring. 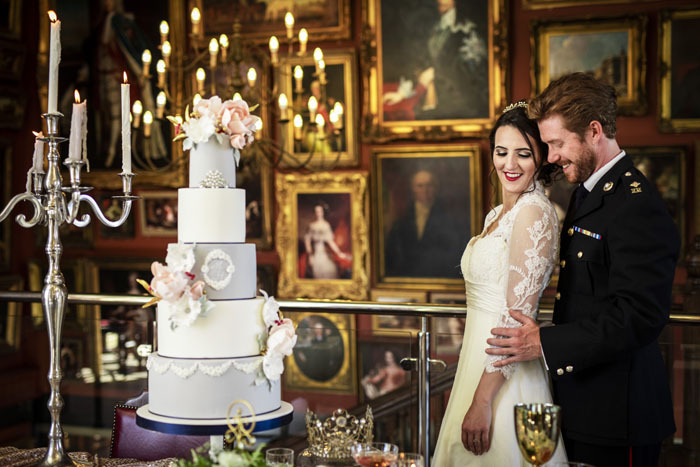 She wanted the design of the cake to look sleek, elegant and romantic but still with great impact to create a show-stopper perfect for a royal wedding. 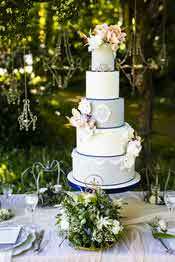 For this reason, she chose a tall, five-tiered cake in tones of soft dove grey and white. She added white floral detailing to reflect some of the details from the stationery, with a monogram to give a personal touch. Stylised peach roses and claret berries were added to give warmth to the grey and white canvas, while golden leaves and berries give a hint of royalty and wealth. The top tier's embellishments reflect the sparkle that is always present in a royal engagement ring, along with two little crowns to represent the royal couple. 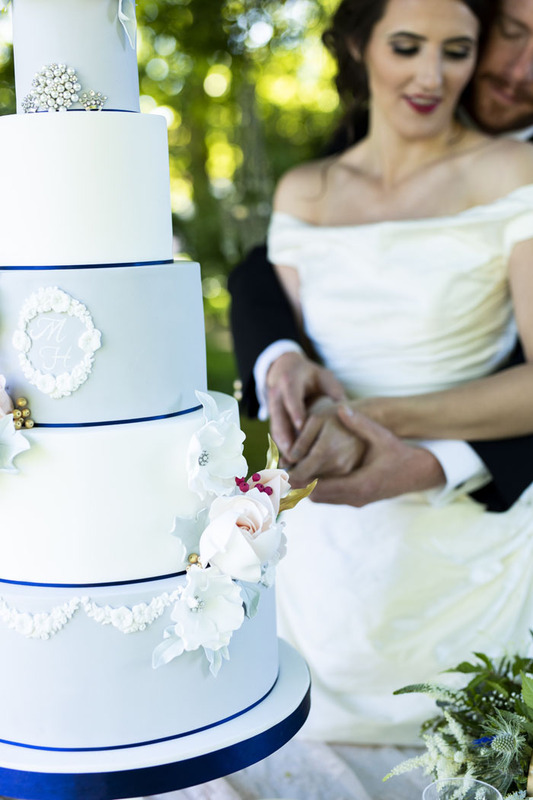 She also provided the team on the day with samples of a lemon and elderflower sponge, the flavour of choice for the royal family and the perfect, refreshing flavour choice for any spring or summer wedding. Bekki’s award-winning wedding cake designs taste just as good as they look. 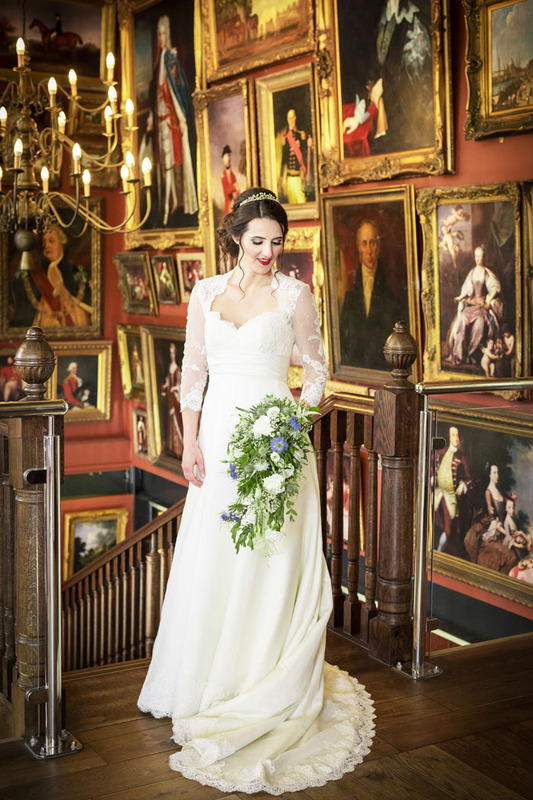 Kate Rushall, owner of Bridal Reloved, provided us with dresses from some of the best British designers: Alan Hannah, Caroline Castigliano and Stephanie Allin. She chose the designers that had been favoured by regal brides in the past. 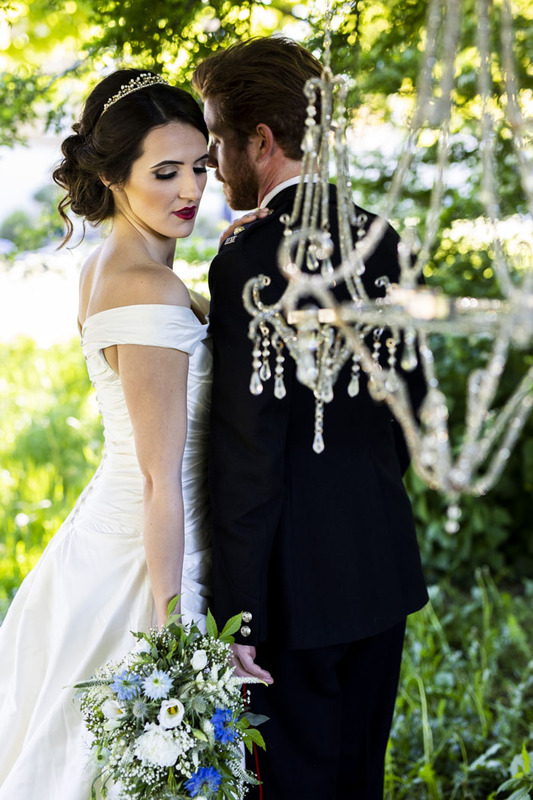 The Stephanie Allin gown was silk with a bardot neckline, a classic and elegant gown. 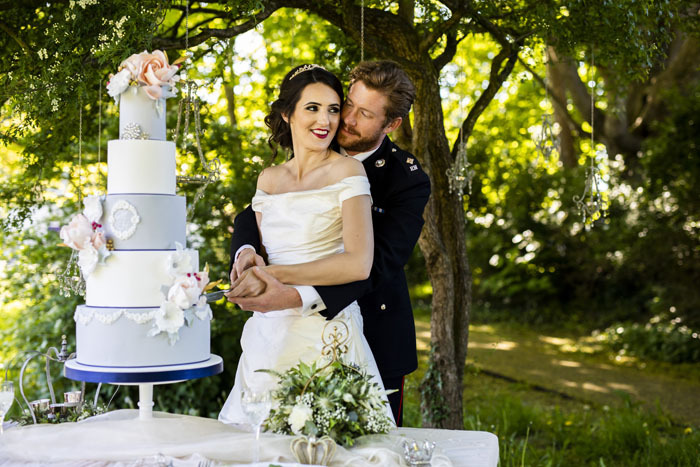 The Caroline Castigliano was a combination of satin, organza and lace with a full sleeve and conservative neckline. It had an illusion back and a full lace trim edge. 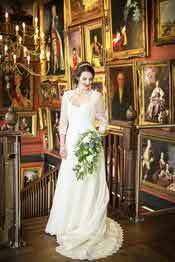 The Alan Hannah Gown was satin bodice with a crystal edge and a silk organza skirt with a very full train. 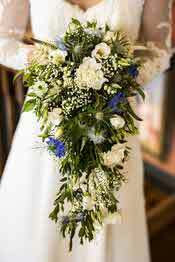 Floral Design by Jay at Carousel & Co set the scene with his beautiful bouquets. 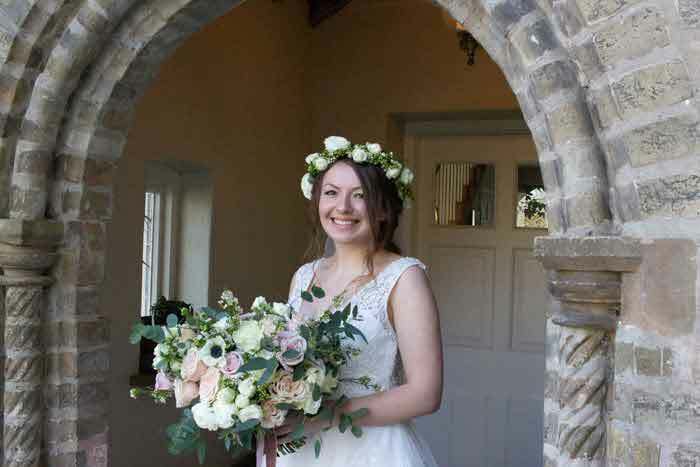 Floral design by Jay is an independent florist covering Dorset and surrounding areas, specialising in wedding floral design as well as events, occasions and sympathy. 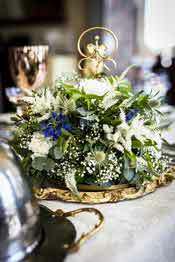 Stunning arrangements incorporated astillbe, carnations erynguim, gypsophila, nigelas and veronicas. 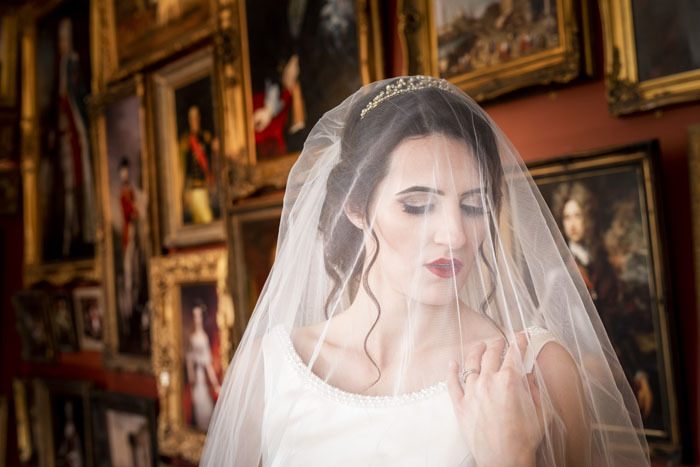 Raechelle from Enchanted Beauty Bournemouth - Special Occasions and Wedding Hair and Makeup provided Samantha Shapley (our lovely Meghan for the day) with an elegant and classic look. 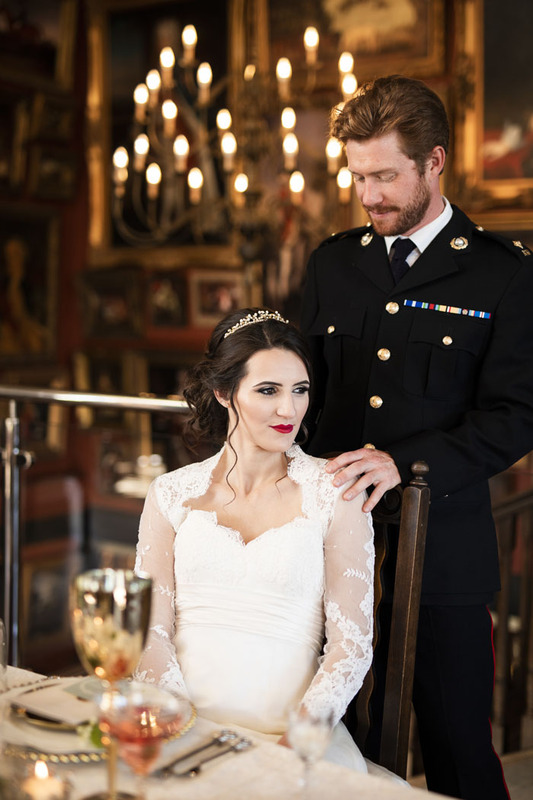 To incorporate and complement the style of the tiara, she created a romantic curly up-do. 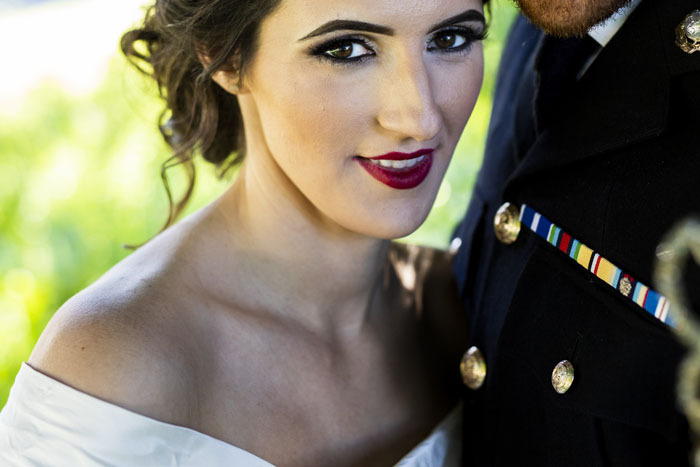 Raechelle went for a natural yet glamorous look for the make-up with champagne and smokey brown eyes with PrimaLash real human hair strip lashes and finished the look with romantic red lips. 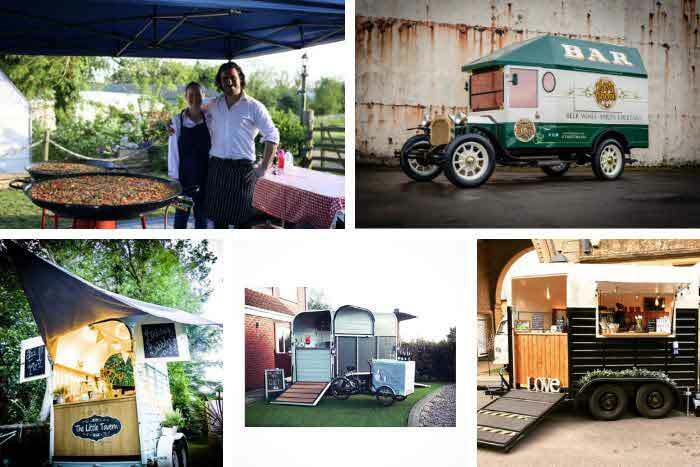 Julie Nicholls Weddings and Events styled the venue for the photo shoot, both indoors and outdoors. Julie brought in elegant and unique pieces that can’t be found on the high street. A regal style but also with modern, quirky touches. 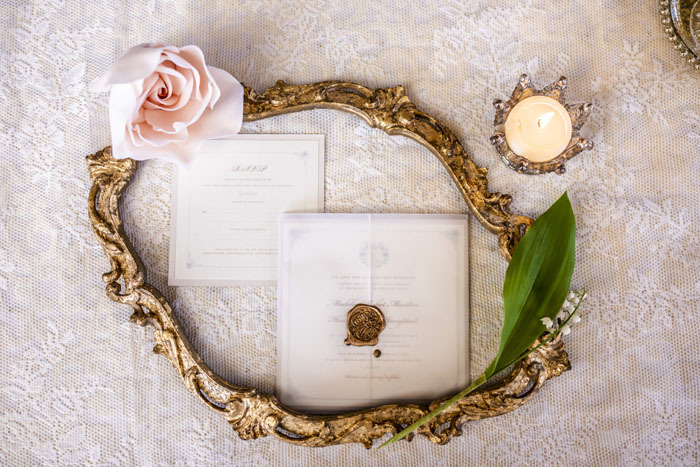 Meghan is a talented calligrapher and is reported to have an eye for detail so Julie wanted to bring in little details that make a difference such as the crystal glasses with tea light candles, layered plates, and a mix of glassware featuring gold and blush goblets and champagne glasses with gold detailing. 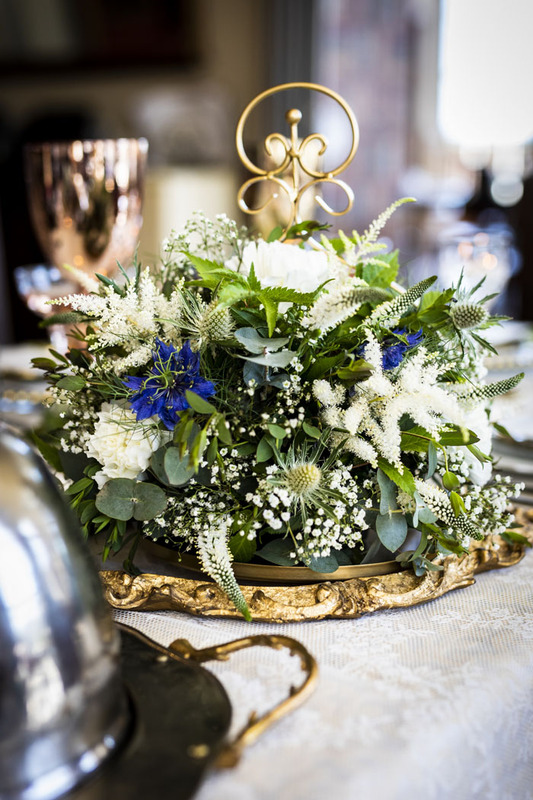 Julie added textures with cloths and napkins and included a small touch of Lily of the Valley for the fragrance, as it’s often thought of as the flower of fairies - perfect for a fairytale wedding. 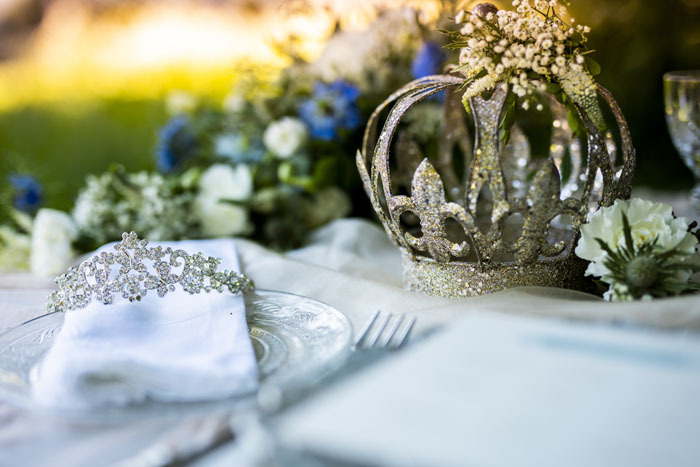 Tiaras by Becky created the tiara with a classy but modern twist, full of freshwater pearls alongside gold cased Swarovski crystals for the perfect traditional look. 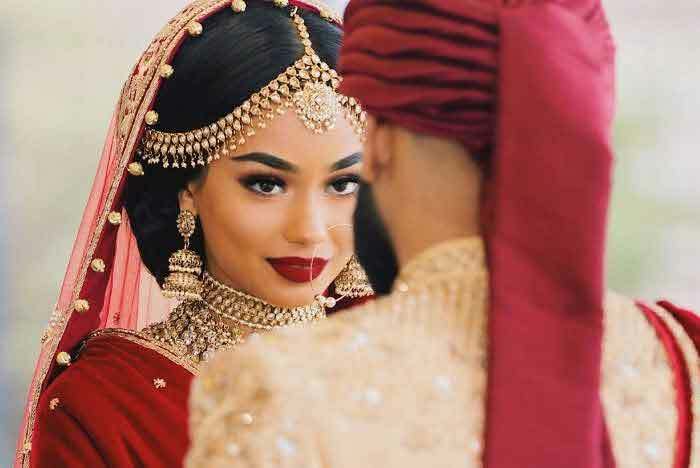 Hey Create provided pretty traditional post box which can be changed according to the names of the happy couple and their wedding date. 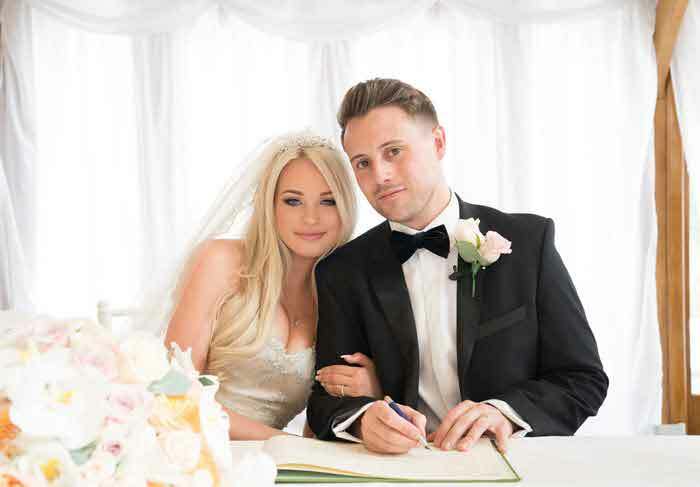 For more Dorset wedding inspiration, pick up the latest edition of Dorset, Wiltshire & Hampshire Bride magazine. 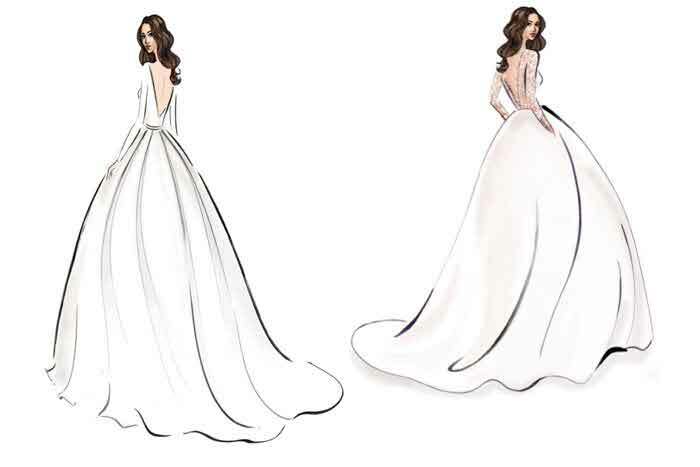 What will Meghan Markle wear on her wedding day?